Salman Khan's Bajrangi Bhaijaan has already smashed many records at box office this year, and now we're eagerly waiting for another blockbuster of Salman! 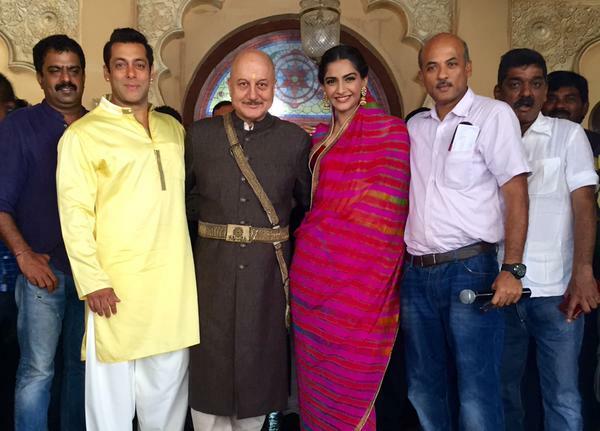 Earlier it was reported Salman will be seen playing double role in Prem Ratan Dhan Payo. It's a family drama film, where one of Salman's character is of a King and another is of a common man. Now, the latest news about the film is that, Salman Khan will be seen speaking french in scene, where one of Salman's characters will be crowned as a King. Whilst many journalists across the globe are invited for the ceremony, Salman Khan also answers some questions of the media in French. Prem Ratan Dhan Payo also stars Sonam Kapoor, Swara Bhaskar, Neil Nitin Mukesh, Armaan Kohli, and Anupam Kher. The film is scheduled to release on November 1st.